Ideal for commercial, industrial and agricultural buildings, and suitable for any building with a large roof area. The system has an industry-leading flow capacity of 11.8 litres/second, when used with a centrally positioned outlet and laid to a 1:350 fall. Our XtraFlo industrial gutter system, manufactured by FloPlast, carries a 10 year guarantee and is available in black, white and grey. Please note when comparing prices that this system has a much greater capacity when compared to other "equivalent" 150mm systems. PBSL's Industrial gutter connects to 110mm pipe and fittings for maximum water discharge, up to an eye-popping 11.8 litres per second with the outlet positioned at the end of the run. To put that into perspective this is equivalent to five standard half round gutters stacked on top of each other! The key facts about this system can be viewed on our PBSL Group industrial gutter video introduction. Like a larger version of our domestic deepflow system, our XtraFlo gutter has a deep oval profile. This is what makes it ideal for catching large quantities of water at peak flow rates as the extra deep capacity ensures that there is no chance that the rainwater can run into the gutter and back out over the front edge like it does on some 150mm systems. Our Industrial Gutter system is available from stock for immediate delivery in gloss Black, White and Grey. 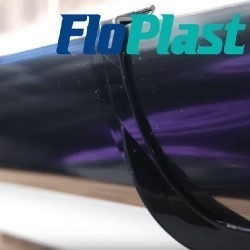 It is manufactured in the UK by FloPlast, the market leaders in UK gutter manufacturing. This system is covered by a BSI Kitemark - no. KM501316. It carries a full ten year guarantee. Silicon lubricant should be used on all installations - this allows the gutter to expand and contract freely in different extremes of weather without causing any wear to the seals. Due to the large amount of water (or potentially snow) that can be carried in a 170mm gutter we recommend that fascia brackets are spaced at a maximum of 600mm centres. For ordering purposes a good rule of thumb is to allow 7 brackets for each length of gutter that you buy. Like most commercial gutters, our industrial system uses a 110mm downpipe system. This is robust enough to withstand the light impact damage that can happen on industrial or agricultural sites and has a very high flow rate to cope with the discharge from the guttering at times of peak rainfall. Downpipe clips should be spaced at a maximum of 1.8m centres. Witht the exception of the silicon lubricant noted above (SL40) should be used on all installations. 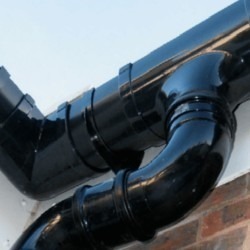 The installation procedure for this gutter system is the same as for standard guttering - if this is your first time installing guttering we recommend that you take some time to browse through our Guides & Tips pages.